Home » Blogs » Charles Gaba's blog » Donald Trump is about to do to health insurance what Trump University did to education. Donald Trump is about to do to health insurance what Trump University did to education. The order would, in effect, exempt many association health plans, groups of small businesses that pool together to buy health insurance, from core Obamacare requirements like the coverage of certain essential health benefits. It would potentially allow individuals to join these plans too, which would put individual insurance marketplaces in serious peril by drawing younger and healthier people away from them. The draft order is also said to broaden the definition of short-term insurance, which is also exempt from the law’s regulations. Together, these changes represent a serious threat to Obamacare: President Trump seems ready to open more loopholes for more people to buy insurance outside the health care law’s markets, which experts anticipate would destabilize the market for customers who are left behind with higher premiums and fewer insurers. The Trump administration on Thursday proposed new rules to let certain small businesses and trade groups band together to buy health care, in its latest move that could weaken Obamacare's insurance marketplaces. The expansion of so-called association health plans is part of a broader effort to encourage the rise of cheaper coverage options that are exempt from certain Obamacare patient protections and benefit rules. The proposed rules stem from an executive order President Donald Trump signed in October directing federal agencies to loosen restrictions on short-term health insurance and association health plans, in a bid to create more insurance competition and drive down premiums. The administration's move was praised by many business groups and conservative lawmakers, including Sen. Rand Paul (R-Ky.), who has long advocated for an expansion of such plans. "Conservative health care reform is alive and well, and I will keep working with President Trump to build on this progress," Paul said in a statement. However, state insurance regulators and Obamacare advocates have warned that lax rules could open the door to a new wave of poorly regulated health plans that exclude coverage of key services required by the Affordable Care Act, such as hospitalizations and prescription drugs. Let me repeat that: Hospitalization and prescription drug coverage wouldn't be required by something calling itself a "health insurance policy". “The Trump administration has declared open season for fraudsters selling junk insurance while those with pre-existing conditions will find health care further and further out of reach,” said Sen. Ron Wyden (D-Ore.), the top Democrat on the Senate Finance Committee. The association plans, however, aren’t exempt from the popular Obamacare provision banning insurers from charging people more or denying coverage based on a pre-existing condition. ...but when you think about it for more than a millisecond, that's a distinction without a difference: All one of the short term/association plans--I'm calling them #ShortAssPlans--has to do to deny people with, say, cancer, is to simply not include chemotherapy as a covered service. Voila, they just chopped the premiums down to size like magic! If and when these #ShortAssPlans actually go into existence (and Short Term Plans, or STPs, already exist today), the individual market would be deliberately split into high- and low-risk pools by design. Some would argue that it was already headed that way before Trump took office, but his cutting off Cost Sharing Reduction (CSR) reimbursements last fall sped that process along somewhat...and the repeal of the Individual Mandate (starting in 2019) will ramp that up further yet. #ShortAssPlans would be the final phase in wiping out the ACA-compliant individual market for anyone earning more than 400% of the Federal Poverty Line. According to the official numbers from CMS (and this is Trump's CMS, I should remind you), in 2017, unsubsidized/full price individual market plan premiums averaged around $467 per month, or $5,604/year, which already stings a bit for most people if they aren't receiving financial assistance. Remember, that's basically for a Silver ACA-style plan. Let's say that you have 100 people currently using an average of $467/month in healthcare services (for the moment, I'm ignoring profit margins and the like). That's a total of $46,700 per month for all 100 people. Now, let's split those 100 people into two groups of 50: Half are higher risk and go for the ACA-compliant plan, the other half are lower risk and go for a #ShortAssPlan. What would they have to pay? Well, the high-risk half account for 97% of all medical expenses ($45,300), while the low risk half only eat up 3% ($1,400). Based on that, the low-risk half would only have to pay around $28/month, which is awesome for them! Meanwhile, the high-risk half would have to pay $906/month...nearly double what they are today. Ouch! Now, the good news is that the vast majority of those enrolling in ACA exchange plans would receive tax credits to cover the bulk of their premiums. For instance, a single adult earning $30,000/year would only have to pay about $205/month for the benchmark Silver plan (8.2% of their income), with the government picking up the other $700 or so. The bad news--and again, this is already a problem with the ACA to a lesser extent today--is that if that same 40-year old single adult earns more than 400% of the Federal Poverty Line (around $48,000), they would have to pay the full $906/month, or $10,872/year. That's over 22% of their gross income. Needless to say, this will cause even more of those who aren't subsidized to move off of ACA exchange policies onto #ShortAssPlans. Now you're left with a 80/20 split: 80% of those 100 people choose the Association Plan while the other 20% (who eat up 82% of all medical expenses) choose the fully ACA-compliant policy. The 40-year old earning $30,000/year would still only pay $205/month, with the government covering the other $1,710. The 40-year old earning over $48K (let's call it $49K) would have to pay the full $1,915/month...47% of their gross income. It just gets worse from there. You can see how quickly the ACA exchange market would become a de facto High Risk Pool, and an insanely expensive one at that. Aside from this being morally questionable, it would also become absurdly expensive for the federal government, as APTC subsidies would shoot through the roof. Of course, that's already happening in 2018 thanks to Trump cutting off Cost Sharing Reduction (CSR) reimbursement payments to carriers; doing so simply led the carriers to shift those costs onto the premiums themselves, meaning much higher APTC subsidies for the feds. Bravo, Trump Administration! Yeah...somehow I don't see that working out very well. 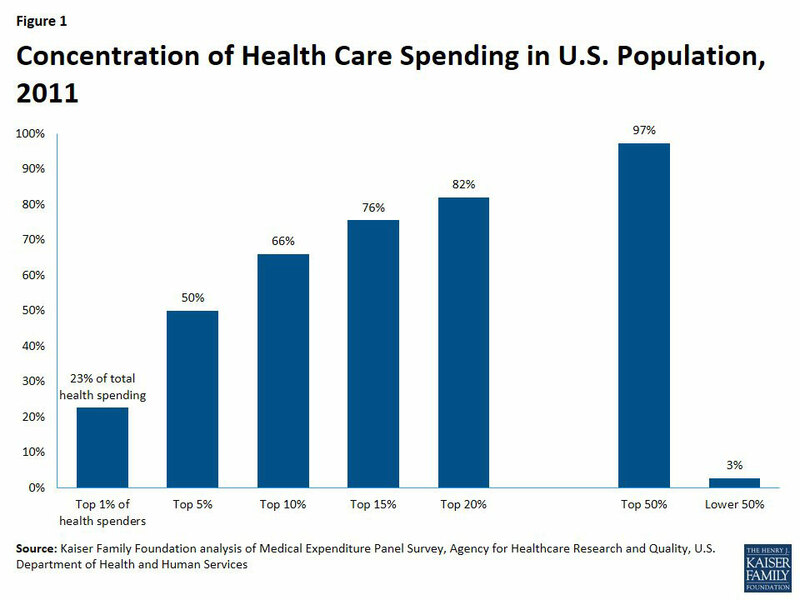 The bottom line is this: Slicing up the risk pool does absolutely nothing to lower the total cost of healthcare. It's also important to remember that the dollar figures above don't include deductibles or co-pays; remember, that $467/mo is for a decent Silver plan, which only covers about 70% of medical costs. Also bear in mind that the other major problem with this scenario is that you never know who's going to turn out to have a "high risk" medical condition. Any one of the 50%, 80%, 90% or 99% who choose to enroll in the cheap #ShortAssPlan which presumably wouldn't cover the ACA's Essential Health Benefits could suddenly find themselves diagnosed with cancer, diabetes, a problematic pregnancy or whatever, and now they're screwed because their "cheap" plan doesn't cover the very healthcare needs that they find themselves requiring. They have to dump their #ShortAssPlan and move to the ACA exchange (which requires their ailment be covered). If they're below 400% FPL, they'll find the policies there to be affordable. It may cost more than the #ShortAssPlan, but after the tax credits, it'll at least be reasonable. This would cost them around $30,000 total for the year...out of a total income of $49,000 (and that assumes they're able to actually keep working at full capacity throughout the year, which is hard to do while undergoing chemotherapy, surgery or whatever). They're likely financially ruined. They can pay full price for everything. Which could run into hundreds of thousands of dollars. Perhaps they sell their house, their car, take out a loan. They're financially ruined. Everyone with a diagnosed pre-existing condition earning 100-400% of the Federal Poverty Line would enroll in a heavily (and I do mean heavily) subsidized ACA exchange plan. Most people without a diagnosed pre-existing condition (regardless of income) would enroll in a "cheap" #ShortAssPlan...right up until they're diagnosed with something not covered. ...those over 400% FPL with expensive ailments would be...screwed. Personal bankruptcy, death sentence or both. Packard, who has Hodgkin’s Lymphoma, has regularly been tweeting at Trump about health care and other topics at least since the election. The day before she was blocked, she put the president on blast for supporting a bill that would jeopardize the lives of people like her who rely on Obamacare exchanges for coverage. As ThinkProgress detailed earlier this week, under Graham-Cassidy, a 40-year-old diagnosed with metastatic cancer “could expect to pay a $140,510 surcharge on their annual health premium, effectively making many families choose between being bankrupted by their insurance company or being bankrupted by their hospital bills.” Packard is 41. “I cannot afford [a $141,000 premium] and I suspect most people cannot,” Packard said. I pay 100 percent of my premiums, but I'm fully aware of the millions of Americans that have not been as fortunate and can't afford coverage without the Medicaid expansion and/or tax credits now in danger. Obamacare means people in near-poverty finally being able to see a doctor. It's a child like Jimmy Kimmel's, being insurable as an adult. It's my new friend Amy in Texas with stage 3 breast cancer, being able to raise her three kids as a single mother and fight her cancer (and the private insurance company) without having to worry about hitting annual caps or being able to renew her insurance after she's cancer-free. It's my new friends Linnea and Lysa and Allen that are all bravely fighting advanced lung cancer, year after year, having hope that they will live long enough for a cure. It's my friend Julie with lupus, who has fought leukemia and won (twice), but doesn't know whether it will come back. Now, if Congress and Trump were to decide to remove the 400% FPL cap on tax credits so that no one has to pay more than 9-10% of their income for an exchange plan regardless of income, this might be vaguely workable. It would cost the federal government an absolute fortune, and it would turn the ACA exchanges into a national high risk pool/dumping ground, but it could theoretically work...but they won't do that, of course. Furthermore, insurance companies, already upset and dropping out due to problems with the individual market risk pool, would flee anyway, making the existing problem (few carriers participating in many areas) even worse. I'll have much more to write about this soon.